After having captured the hearts and appetites of many with their restaurants Maharlika and Jeepney, New York-based restaurateurs Nicole Ponseca and Miguel Trinidad continue to pave the way for Filipino food in America with what can perhaps be considered their third “child” together as business partners: a cookbook. 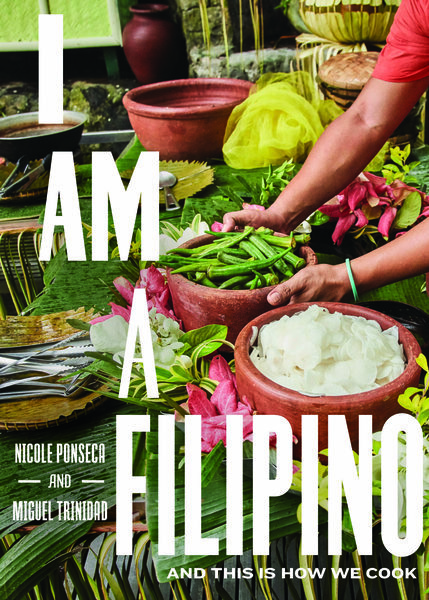 I Am A Filipino: And is Is How We Cook is unapologetically impassioned by name and in its diverse index of modern recipes that includes home cooking staples like kare-kare and kinilaw, Chinese-influenced food like lumpia and pancit, as well as dishes with Spanish, Mexican, and American roots. And of course, what would a Filipino cookbook be without some variations of adobo? Using ingredients easily found in any market and simple cooking techniques such as grilling, boiling, and braising, one can recreate the taste and feeling of a classic Filipino kamayan dinner with salty, sweet, sour, rich, fatty, bright, and bold flavors reflective of our country’s rich history.